Tube complement: 7H7 mixer, 6J5GT oscillator, 7A7 IF, 6SQ7GT detector, 25L6GT audio output, 25Z6GT rectifier. Approximately 11-3/8 inches / 289 mm wide. Even though the 35L6 and 35Z5 tubes were readily available, this 1941 design still uses the earlier 25L6 and 25Z6, and a ballast resistor tapped for the pilot light. The Riders service information for this set shows a 6SD7 mixer and a 6SK7 IF; this radio's icky 7H7 and 7A7 loktal tubes must have been a late-production substitution. 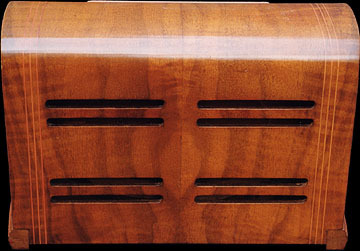 This radio has a fully finished back. 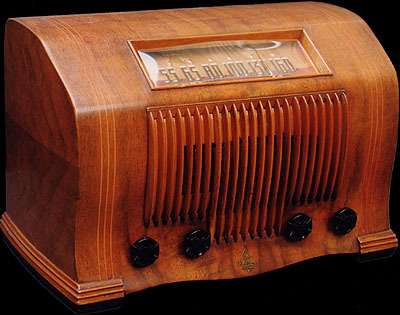 Like many other radios in my collection, the chassis slides in from the bottom.